﻿﻿ Post 9/11 GI Bill and Yellow Ribbon: Education Benefits for Military Veterans Your email is invalid. Try submitting again. For U.S. military veterans returning home after serving for America, finding jobs in civilian life may be challenging, especially without an appropriate education or training. In recognition for defending the nation, several government programs have been enacted to help ease the struggle of transitioning vets seeking higher education. The Post 9/11 GI Bill, also known as chapter 33, provides benefits that can be applied toward any public institution. The benefits cover the full resident tuition and fees for public schools education. Qualified Veterans must have served at least 90 days of active duty service after September 10, 2001 and have received an honorable discharge. Veterans who served for a minimum period of 36 months will be paid 100% of benefits. Those who served between 90 days and 36 months, will receive a percentage of the full benefits depending on the length of the service. Those who want to attend a private school or a public school as a nonresident student can get additional financial assistance from the Yellow Ribbon program, a supplement to the Post-9/11 Veterans Educational Assistance Act of 2008. Institutions of higher learning participating to the Yellow Ribbon agree to provide eligible student veterans with a tuition waiver or grant that is matched dollar for dollar up to the full cost of tuition by the U.S. Department of Veterans Affairs (VA). Eligible students must qualify for 100% of the Post-9/11 GI Bill and be able to provide a Certificate of Eligibility from the VA Office to the school. Yellow Ribbon payments are awarded on a first come first served basis. 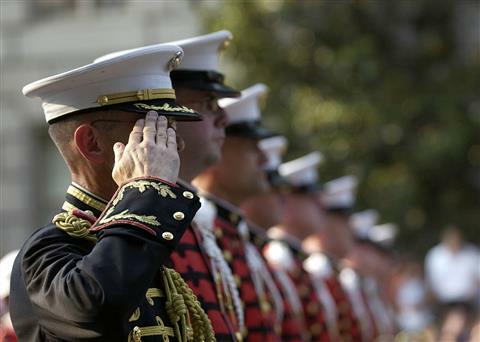 Under the Montgomery GI Bill, two distinct programs are available to members of the U.S. Armed Forces. Eligible members of the Armed Forces in Active Duty pay $100 per month for a year and receive benefits for a maximum of 36 months of education benefits. These benefits can be used for degree and certificate programs, correspondence courses, apprenticeship/job training, flight training, technical or vocational courses, high-tech training, licensing and certification tests, or entrepreneurship training. They can use their benefits for up to ten years if they contribute to a $600 buy-up program. This program provides education and training benefits to reservists who have a six-year obligation in the Selected Reserve, including the Army Reserve, Navy Reserve, Air Force Reserve, Marine Corps Reserve and Coast Guard Reserve, and the Army National Guard and the Air National Guard. Surviving spouses and children of service members who died in the line of duty after September 10, may receive up to 36 months of benefits at the 100% level when attending school. Beneficiaries receive full tuition and fees paid directly to the school for all public school in-state students, a monthly living allowance and a stipend for books and supplies. The endowed scholarship was created in honor of Marine Gunnery Sergeant John D. Fry. Though he was due to return home from Iraq in 2006 with a Bronze Star, Fry volunteered to stay one more week in Iraq to defuse bombs in Ambar Province but was killed by an explosive device leaving behind him his wife and three children. Similarly to the Fry Scholarship, the DEA scholarship offers education and training benefits to eligible dependents of Veterans who are permanently and totally disabled due to a service-related condition or of Veterans who died while on active duty or as a result of a service-related condition. Beneficiaries may receive up to 45 months of benefits. Some of them may be eligible for up to 81 months of benefits. Those who are eligible to both the Fry Scholarship and DEA have to make an irrevocable election between the two programs before applying.